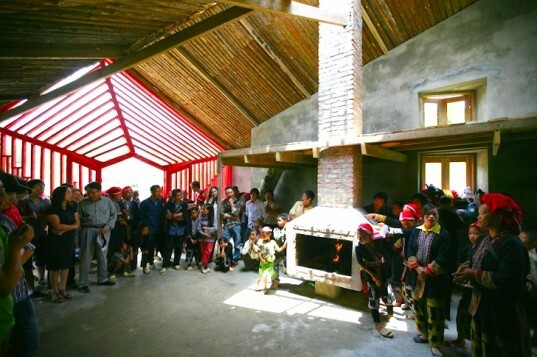 Thousands of people flock to northern Viet Nam's rolling green hills each year, so the Ta Phin commune established a beautiful solar-powered house that will help their community benefit from this influx. Inspired by the Dao woman's traditional red scarf, this colorful landmark and gathering space by 1+1>2 was built for the Ta Phin community using locally-sourced materials. 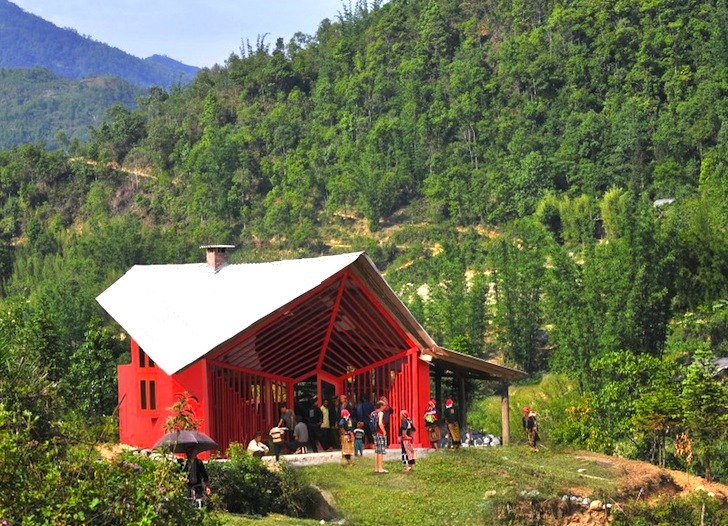 Easily visible from afar, the Ta Phin community house sits amid a verdant setting 17km from Sapa, which is popular among tourists. It comes with an herb garden to promote sustainable agriculture, along with a work space, library and exhibition area – all of which are designed to showcase the traditional crafts and cultural diversity of the local people. Combined in one area, this center helps to put sustainable tourism back into the community’s control. The materials used to construct the building, including recycled wood, stone and adobe brick, were all sourced locally. An energy-efficient fireplace provides warmth in the winter, a rooftop solar panel provides energy, and a rainwater harvesting system takes advantage of the country’s ubiquitous rainfall. A collection tank underground stores the water for later use. Now this is sustainable development.